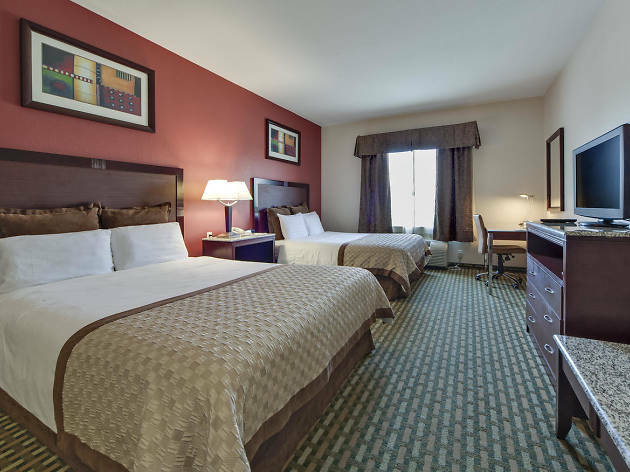 The Hawthorn Suites hotel is conveniently located near Dallas-Fort Worth airport and the corporate offices along the John W. Carpenter Freeway and Las Colinas. The hotel offers a free 24-hour airport shuttle to and from DFW, as well as shuttle service to local attractions (inquire at the front desk). An outdoor pool, onsite parking, laundry facilities, complimentary happy hour a few days a week, a complimentary breakfast buffet, business center, fitness center and free Wi-Fi are available during your stay. 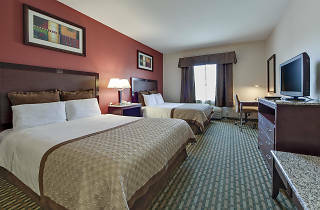 The spacious rooms come with standard amenities such as a flat screen TV, iron and work area. Kitchenettes are also available in select rooms. When you're not lounging at the hotel, schedule a visit to Delaney Vineyards & Winery and sample your way through a flight of fine wines. Nearby Sandy Lake Amusement Park will also delight the younger ones with its thrilling rides and swimming pools. While the little ones soak up the sun at Sandy Lake, the adults can drive 25 minutes out to experience the thrills of Six Flags Over Texas rollercoasters or take a tour of the AT&T Stadium, formerly Cowboys Stadium.